Hummer season is getting into full swing here in Southern NJ. Don't miss out on the fun. Find out how to attract and care for your own little garden treasures! Hurry, before they all head out to my place! 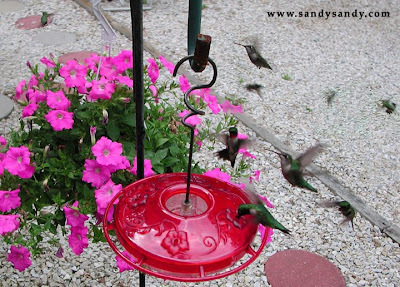 Check out today's post on my Squidoo Lens, 5 Steps To Happy Hummers here. I gave you a blog award Sandy. It's actually for your inspirational one but I thought I'd comment here too. You do put a lot of work into caring for all creatures! Hummers are exciting. I'll be by soon with the longer telephoto! Wow, Great Hummingbird Picture! I love the blur of their wings, and the brilliance of their feathers. It's an exciting picture. And congratulations again on your stock photo work, that's wonderful.